Monkeyflower is now well established as a naturalised alien beside many streams in Northern Ireland. 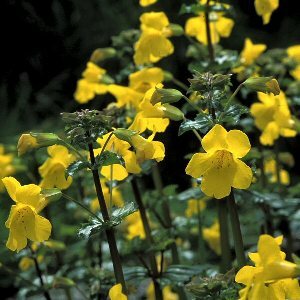 Before c.1992 it was generally thought that the N. Ireland colonies were mostly of Mimulus guttatus from North America, but more careful examination has revealed that most of our wild plants belong to M. x robertsii, a hybrid of garden origin between M. guttatus and the South American M. luteus. 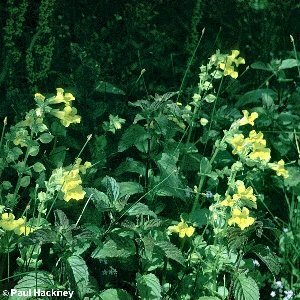 These are rather soft, fleshy, perennial plants with toothed oval opposite leaves and large, showy, bright yellow flowers. They form attractive clumps or colonies on river banks and shingle. The earliest reports of these plants in the wild in Northern Ireland date from around the turn of the 19th - 20th centuries.